This young lady is "The Hair Doll" she is based out of Atlanta, G.A. She proves that age ain't nothing but a number. Currently at the age of 19, she's proving she a force to be reckoned with and I am sure we will be hearing about her for years to come. Below are pictures of her satisfied customers taken from her Instagram page. You can go straight to her page by clicking the link here Instagram to see her full gallery of work as well as contact info. The easiest thing to do when you are afraid is to listen to the negative thoughts in your head. But I am asking you to do the opposite. Part of knowing your worth is believing in yourself. There may be times when you are your only cheerleader. When things are going wrong, your first reaction shouldn't be to flee. Get Your Fight Back!!! Maybe life didn't turn out the way you wanted. Some people stabbed you in the back they hurt you. Your heart is broken but guess what? You are still here you can change your life around today at this moment! Turn your life around start with a simple YES! Commit to yourself that you are tired of whatever situation is holding you back. Now commit that you will make the change. Put on your boxing gloves and get your fight back. Fight for your dreams. Fight for your future. You have what it takes. Believe in Your abilities and your God given talent. Step out on faith keep it moving & don't give up. Let's go!!!! 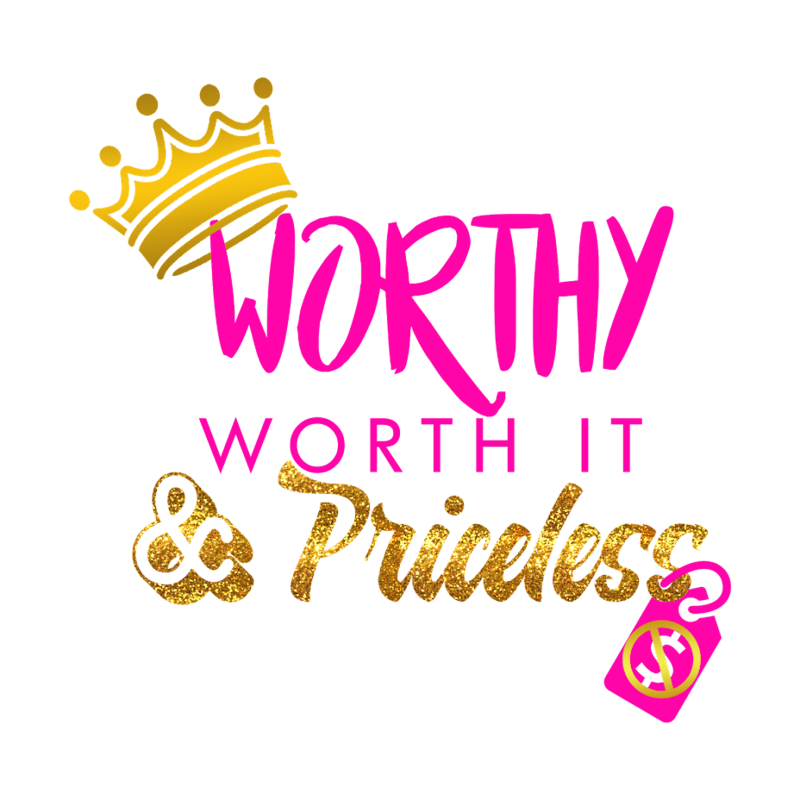 Realize you are Worthy Worth It & Priceless DON'T LET ANYONE TELL YOU DIFFERENT!!! International Hair Expressions is an e-store founded by a group of women who after years of trying all or at least most of the hair on the market with no luck of finding quality hair decided to build a company of their own. The hair collections below describes what they have to offer. Descriptions taken from there website for more info & to order click the link here Website. Brazilian Hair is the most popular type of hair on the market. It blends well with African American textures and Caucasians. Brazilian Hair is one of our best collection hair. It full of natural body, shiner, and a heavier density. All the cuticles are intact and run in the same directions, which eliminates matting and tangling. This hair is re-usable for one year with proper care. It has little to no shedding. We purchase the Raw PONYTAILS that has been cut directly from the donors head. It is 100% Virgin hair. This hair comes in different textures, and is available in colors natural black or medium brown. This hair is re-useable for many years. Our Imani Collection hair is exclusive. Ooh So Savvy is an amazing talent. She's based out of Buffalo,NY. She specializes in color which you can see below. Although color is her specialty healthy hair is her priority. The pictures below are just a few of many. Although I picked pictures to showcase her range of talent there's many pictures I missed. So go to her Facebook and Instagram. Keshia Rogers aka DaMaster Stylist a native of West Palm Beach, FL knew from an early age what she was born to do. She went from styling dolls in preschool to doing her friends hair at the age of 14. By the age of 16 she made a name for herself in Palm Beach county. In 2004, she enrolled in The Beauty Institute of West Palm. In 2005, she obtained her cosmetology license. 2006 she moved to Atlanta to work for Nairobi. And in 2007 she returned home to brand herself as a Master Stylist. What is a Master Stylist? A hair educator, a professional make-up artist, a cosmetologist, just to name a few. It is what Keshia Rogers exemplifies expanding her education in all areas to become one. Though there were struggles, now at the age of 32, a single mother, Keshia has added yet another profession to her belt. A professional jewelry designer. *Excerpts were taken from her bio posted on her website. To read her full bio visit her Website she is also on Instagram and YouTube. DHair Boutique is based out of Dallas, TX and has been featured on multiple YouTube videos by hair gurus. Taken from their website here is a little more about them. DHairBoutique is your 1# Source for Unprocessed Natural Human Hair, we are based out of Dallas Tx 7602 Campbell Rd. Dallas Tx Suite 13. We Offer highest quality human hair extensions. Our goal is to provide our entire customer with 100% Natural hair free of animal hair, Synthetic Fibers, and Chemical Processing. We want each customer to feel comfortable, and aware about their product. Please understand our duty is to serve you, we guarantee to offer our customer superior quality in hair and services. We Stand by INTEGRITY in Each Strand. Below are pictures of customers who have used the hair and posted the results on Instagram. According to the customer in the first picture this is her THIRD time installing the hair and it has been colored as well and she went on to state that there was no shedding. For more click here for the Website and here for Instagram. Don't be fooled by the name whether you want braids, twist or dreads (that's just the short list) Braids by Bee has got you covered. Yes, if you're tenderheaded, you are welcome too. Braids by Bee is based out of Sunrise, FL. Bee has over 20 years in the biz and not only do they braid, dread or twist your hair but Bee and her staff will also let you know how to maintain it and they get you in and out as well. I went on the website to get more info I will tell you this. It's so much great info any question you could think to ask Bee or her staff about services or anything is on there. Dread Extensions best in town we not only do them professionally and with quality human hair we tell you how to keep them up and follow up every 5 weeks. The work speaks for itself so I'm done talking here are the pics & links Website and Facebook. There are certain types of people you need to stay away from those are the "fear talk" people. Those are the people that no matter what you say they always think of the negative. Some people use fear as an instrument to motivate them these are not the people I am talking about. Fear talk people are the ones that no matter how much you tell them "It's going to be alright." "Your going to make it." All they think of is ways it's not and trust me it's not worth it. These people bottom line think that the past is better because they are too afraid to move forward. If you are a "Faith Talker" this can seriously mess you up. I will tell you from experience some people just talk to have something to say but have no intention on following their dreams. These are "great potential people but no work". They have the greatest potential but don't do ANY work to follow their dreams. Obviously, there are a lot of exceptions. Some people need a little push, or someone to believe in them but if you push and motivate and they don't budge please believe it's time to move on. If you're around these people too long it might be contagious. You might start thinking like them or better yet you might be so focused on them you forget yourself. Months ago I was going to change jobs again or at least wanting to. Now mind you there was nothing wrong with my job I loved it! I am an assistant manager in a shoe store finally my retail degree is coming in handy. Well it requires me to drive which at the moment I don't know how to. Now instead of me pushing myself to learn.I put on my running shoes. Fast forward a few days ago my old job called and so did another job I had applied for around that same time. Now at this time I am no longer willing to run I was ready to bloom where I was planted. But me with the "You never know" philosophy I flirted with the idea. But I wasn't totally sure. So I made the two interviews in one day tomorrow (Monday March 3rd) I had all weekend to think of it I was so torn. I no longer had the desire to sit behind a desk overnight and watch my life pass by (I was a night auditor in my previous job) or work in a clothing store on not one of the best sides of town (which was the new opportunity) so why take the interviews. Because I devalued my dreams to suit the company's needs. In other words I put myself on the back burner to get something I no longer wanted or had an interest in. So I woke up Monday morning after a weekend of confusion and realized I wanted to continue on the path I was on.I love my job if I left I would no longer have a management position I would settle. Then fight to get another management position later. And the job I'm currently at pushes me to do the things I have put off (getting my cosmetology license as well as my driving license). There is a blessing in waiting. I may not be where I want today but I don't plan on going anywhere I still have time. So do you don't run because you're afraid don't get distracted. Keep on fighting for your dream. I was at work one day and a customer is in the store loudly asking her friend should she get these shoes "like what do you think?" "Would these look Good?" "Would you wear them?" I mean on and on for about 10 minutes. I know we all ask people their opinion but this was beyond that it seemed like she had an insecurity. Recently I had the same issue my hair wasn't looking the way I wanted it to so I was thinking of changing it so I called my mom and asked her opinion. Then I started to think afterwards why am I calling my mom if I want to change my hair. It's mine. And with the story above I realized that we can't always look to others for their opinion for what we should do on matters that effect us. I am not saying not to get peoples opinion ever but you have to get to a point where we trust ourselves. We generally know what we want to do we just usually want someone to agree with us or give us their prospective. With or without their advice we do what we want to anyway.